An outstanding hub from DT Swiss. Built with precision and delivering top-end performance, these hubs have been winning grand tours races for a long time. Ultra smooth, the hubs feature DT's Ratchet System supplying the ultimate engagement. 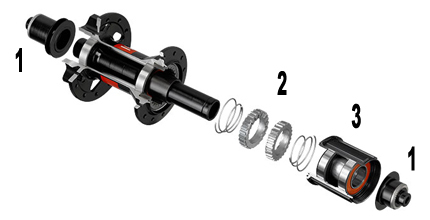 The legendary Ratchet System drive system will last for many years and provide all the performance needed to ride in a pro peloton or on your local shop ride. The 240s non disc versions come stock with 11 speed Shimano rotor configurations in black and available in either 24, 28, 32 spoke hole options.